So you’re wearing a straw hat to an afternoon cocktail party, you happen to be a molecular biologist, and you want to accessorize. The back yard is full of pretty wildflowers that would look great on your hat, but you don’t need to be a scientist to know that within an hour anything you pluck n’ tuck will look like a wilted clump of weeds. But you DO need to be scientist to have access to the solution: Eppendorf tubes. Materials: A nail, needle-nosed pliers, a flame, an Eppendorf tube, water, and a flower. 1. Heat the nail in the flame until hot enough to melt plastic. 2. 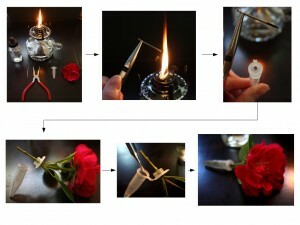 Press the hot nail through the plastic cap of the Eppendoft tube and carefully melt an opening just wide enough to allow the stem of your flower to pass through. 4. Add enough water to fully submerge the stem. 5. Close the cap of the Eppendorf tube and tuck into your hat, or behind your ear.